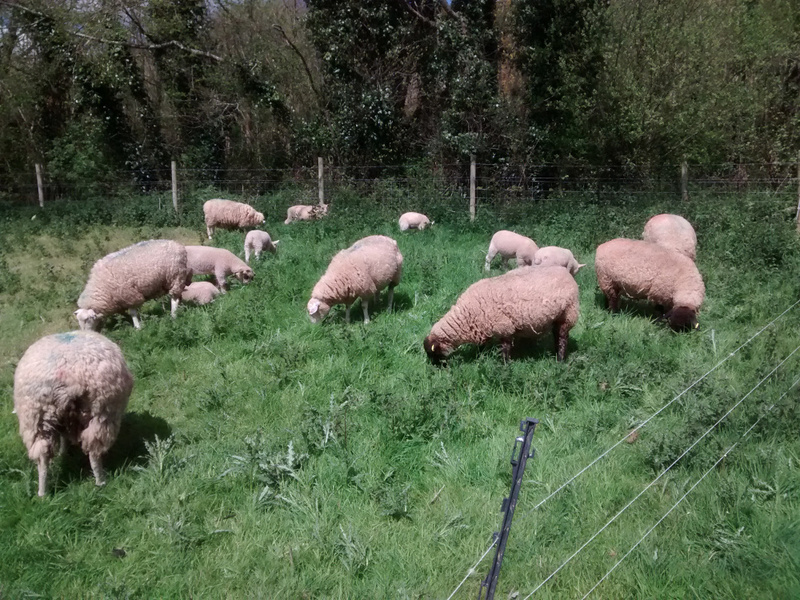 The other ewes and lambs are in our main field, they have plenty of grass for now and the recent rain – which our sheep really don’t like! – means there should continue to be fresh grass for them. With spring well advanced we have put fly repellent on these sheep to keep flies off them, and we will also need to keep checking the lambs for parasitic worm infections – though so far they look to be fine. 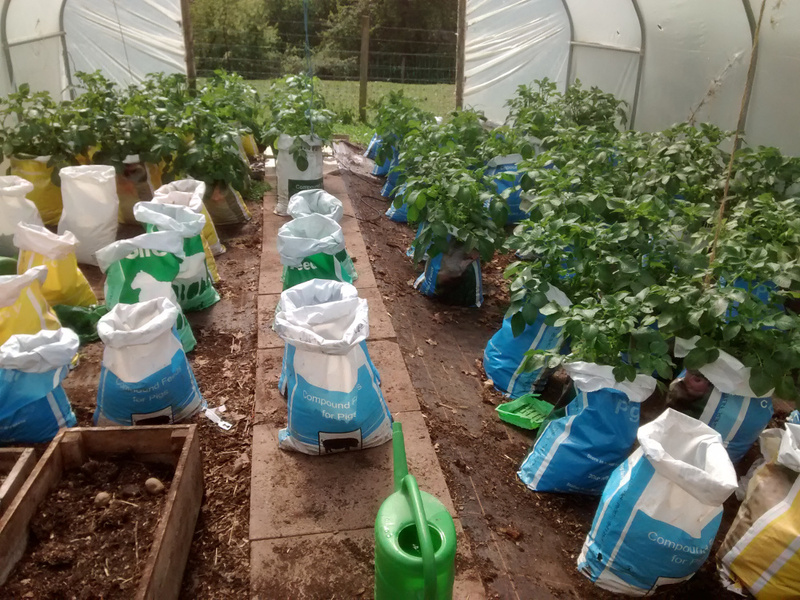 In the tunnels early potatoes are growing fast – potatoes to eat by late May. Crackle’s remaining pigs are six weeks old, very lively, and just weaned. We sent some of the piglets that died to be post-mortemed and as we’ve already reported the results showed no significant infections or problem with them. Why the pregnancy went partially wrong at such a late stage still remains a bit of a mystery. 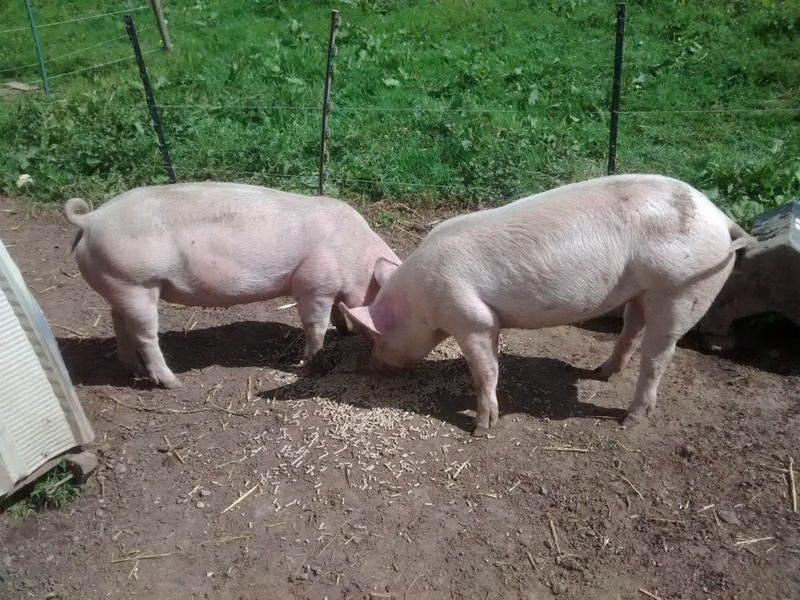 However, the two pigs we bought from another farm recently developed slight pneumonia. They didn’t look very ill, but they were thinner than they should be, their breathing fast and shallow and they were barely growing. We had to treat them with antibiotics, you can see the pig on the right in the picture is still a bit thin. Most pig farms will vaccinate pigs against pneumonia but, for a variety of reasons, we didn’t/can’t. The good news is they are getting better, enjoying their food again and doing properly piggy things again. Its possible Crackle also got infected with their pneumonia and fighting the disease caused her to farrow early, or maybe she had another infection or non at all. The truth is we just don’t know. But what we could, and perhaps should, also have done is take her temperature – if it was high she might well have been fighting an infection and we could have treated her. We did treat the piglets with antibiotic but, sadly, too late for some of them.